Physical spaces for music concerts, installation and multimedia work invite to work with the available air volume in the space by surrounding it with sound sources, ie. loudspeakers, thus filling the void with moving air molecules, hence sound. Advanced sound rendering techniques also seem to allow the placement of virtual sound sources everywhere in the space thus spanned. Still the perception of arbitrary and freely moving sound sources is not often encountered, may it be in gallery spaces, movie theaters, concert venues and even acoustic research laboratories. In this talk I would like to propose another approach to the way the spatial dimension of sound can be conceived and shaped. Taking the room and its architectural acoustics back into the equation and actively exploiting the responsiveness of the room and its boundary layers places the moving air molecules into a sensible context and back into relation with the actual physical space we create artworks for. Trained in Violin and Guitar, Peter developed a strong interest in sound direction, electroacoustic composition and improvisation. He considers the electronic studio a musical instrument, and has worked in sound design, instrument building and performance of music with live electronics. He received a honorary mention of the Prix Ars Electronica and regularly performs in the contemporary music world. 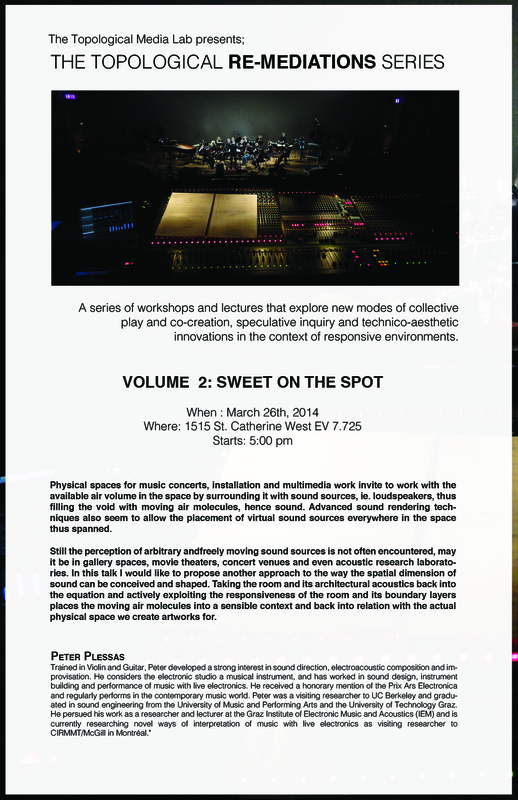 Peter was a visiting researcher to UC Berkeley and graduated in sound engineering from the University of Music and Performing Arts and the University of Technology Graz. He persued his work as a researcher and lecturer at the Graz Institute of Electronic Music and Acoustics (IEM) and is currently researching novel ways of interpretation of music with live electronics as visiting researcher to CIRMMT/McGill in Montréal.